Write and deliver for the ear, not the eye. Readers have the luxury of rereading. Listeners have to catch your message as it flies by. Make your first point short and sweet. And make it early, to reassure your audience that you won’t waste their time. Contact Marian Calabro to craft your message — or to turn your raw first draft into polished gold. Don’t worry if your deadline is looming. Bring me your bare-bones theme, your pile of notes, or your rough draft. I’ll rapidly transform them into spoken words that sing. I’m proud to have studied basic through advanced speechwriting with global expert Joan Detz. I also do public speaking, especially to business groups on ways to use history in marketing, and I teach a three-hour interactive workshop on the Basics of Public Speaking. Thank you so much for your wonderful presentation and discussion. Every member of the audience was inspired, entertained, and motivated to incorporate history into our own businesses. Marian Calabro wrote an outstanding speech for our client, the CEO of [a college in Virginia], who by her own admission was not quite sure of the messages she wanted to deliver. Not only did Marian manage to present the tone and content everyone was hoping for, she actually led the process, persuading the CEO to focus on the issues at hand and prioritize her messages. The task we presented was major, and Ms. Calabro embraced it with both great professionalism and a sense of humor. Unearthing the story, crafting an organized narrative from raw material, finessing all the details — Marian Calabro and her colleagues at CorporateHistory.net do this work not just for commissioned company histories but for individual business owners and executives who want to leave a written recorded legacy. If you’re intrigued by the notion of combining your personal and professional story, contact us. 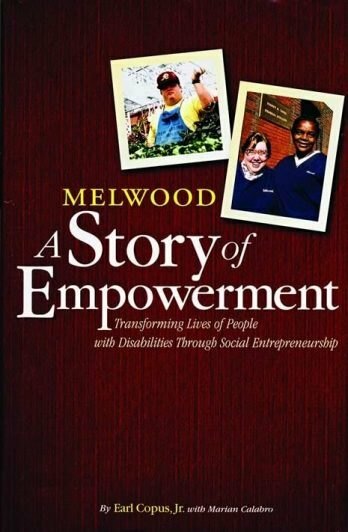 Melwood: A Story of Empowerment, written by Marian Calabro with and for Melwood President Emeritus Earl Copus, is a great example. (Melwood is a private nonprofit agency that serves adults with developmental disabilities.) The first half is a memoir of Melwood’s growth in the past 40 years, as seen through Earl’s eyes. It’s packed with human-interest stories about Melwood’s clients along with a few tales that Earl tells on himself. In the second half, he shares his hard-earned wisdom on running a not-for-profit organization. Marian Calabro was an invaluable organizer and writing partner. She became a friend to Melwood as well, embracing our story as if it were her own and easing all of us through this challenging process. Our book’s positive reviews owe a lot to her skills and commitment.